I saw your ad on craigslist for the shower chair for disabled or injured http://toronto.en.craigslist.ca/tor/for/1281704208.html . In your ad you say "I have a used aluminum shower chair which I've been using due to a broken leg." Are you nuts? The last thing a disabled or injured person should be using is a chair with a broken leg. Especially in the shower. I believe the reason shower chairs were invented was for this purpose. I think a disabled person would rather sit and wash themselves rather than stand. Wouldn't you agree? The medical experts seem to agree with me, if they didn't they probably wouldn't have recommended one. I don't see your reasoning and I don't want to. Unless your interested in purchasing the product please don't message me retardedness.Thanks. 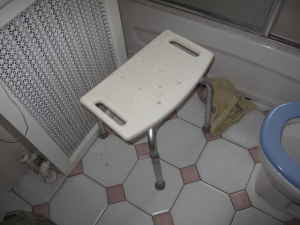 I don't deny that disabled people should be using a chair in the shower. It is just that (by your own admission) you are selling one with a broken leg.